When it comes to kids, raising them takes a lot of dedication. There’s so much hard work and sacrifice parents give every single day. While certain scenarios like wetting the bad or leaving drawings on the wall are unavoidable, there’s a way to work around those problems. Luckily, there are a ton of innovative ways to make parenting so much easier. If you’re always losing your kids when you go out in public, there’s a very easy solution to keep track of them in big crowds! 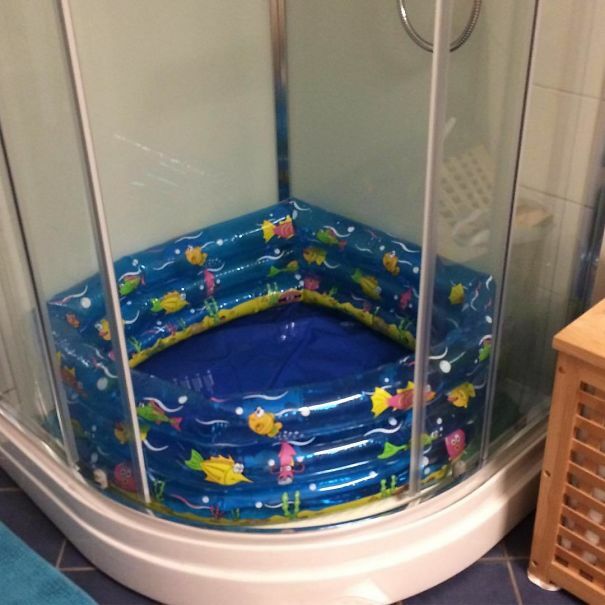 All you need to do is add the baby pool into the shower. It’s pretty handy when you’re traveling too. The fact that the pool can fit perfectly in that shower is seriously satisfying to my soul. It’s a brilliant idea not only for kids but one for adults as well.